Standard 4 bunk hut on the shore of Lake Guyon, a popular fishing lake. 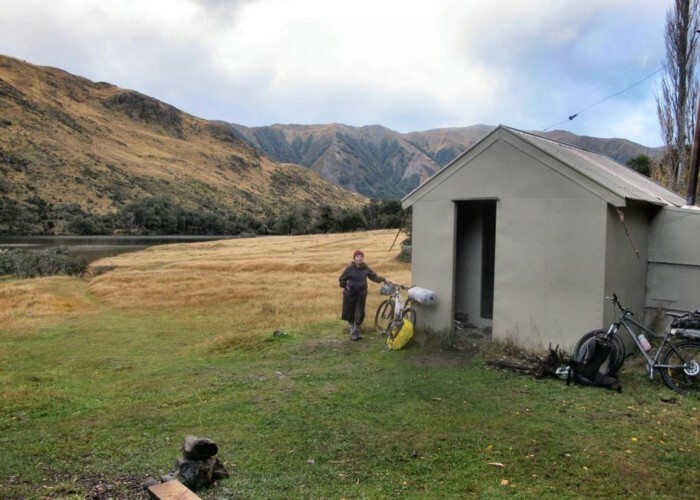 This little hut is just 30 minutes detour from the St James Cycle Trail, so it can be busy with hunters, fishers, and cyclists. There is ample camping space around the hut. The hut is located next to the Lake Guyon Homestead site. Visible here are the lines of poplars, rock walls, and other archaeological remains. The runholder was William Travers, the Irish lawyer, politician and naturalist. Travers named the nearby Ada, Henry (his son), Boyle, and Anne Rivers. The run was amalgamated into the St James between 1860 and 1879. Lake Guyon Hut • By johnnboy. Licence: C.
Small stream just behind the hut. Via the Fowler Pass Track in the east, Stanley River Track in the south, or the Waiau River. 30 minutes up from the Waiau River (St James Walkway, Maling Pass, or Charlies Saddle). 4WD access over Maling Pass leads much of the way to the hut. Added 12 July 2009 by Andrew BarkerAndrew Barker. 3 revisions, most recently 7 April 2015 by MatthewMatthew.